I can sing a rainbow…sing a rainbow….sing along with me! 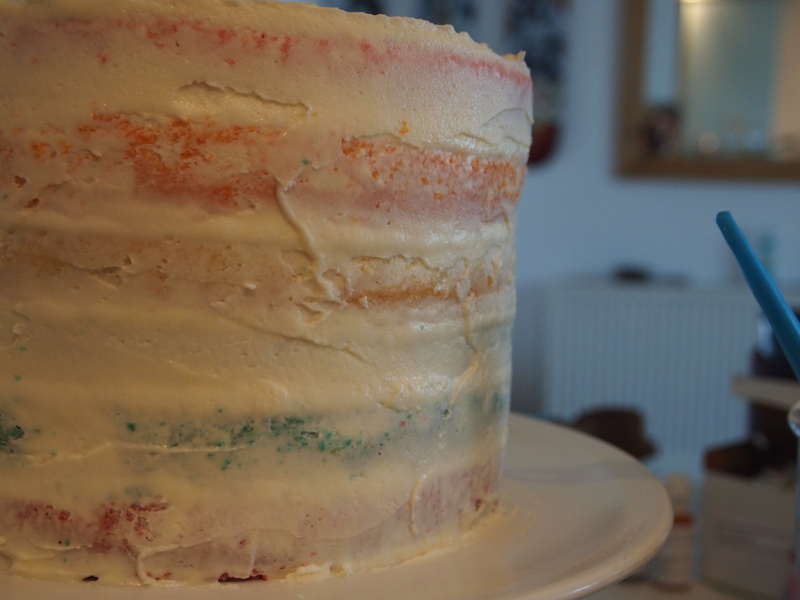 Its been a while (yet again) since I have blogged and I have been constantly on the go with different styles and types of cake, however when deciding to do a blog post today the one that has stayed in my mind as my favourite of late is the rainbow cake I created for one of my best friends birthdays. 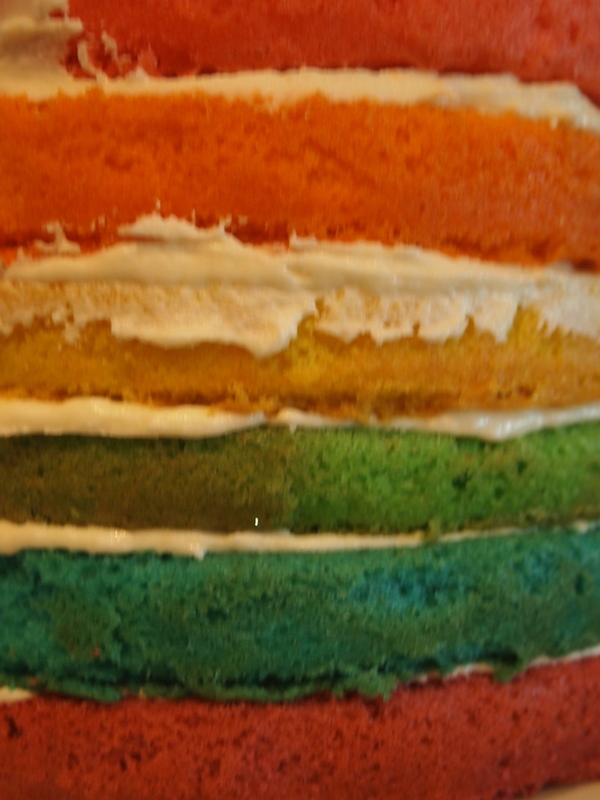 Rainbow cake is one of those surprises that can’t help but make people smile when they cut into the cake and discover the multitude of colour inside! For this blog post instead of just posting pics of the finished cake I decided to take step by step photographs to give you a true idea of the work that goes into a cake like this – soooo much fun though! 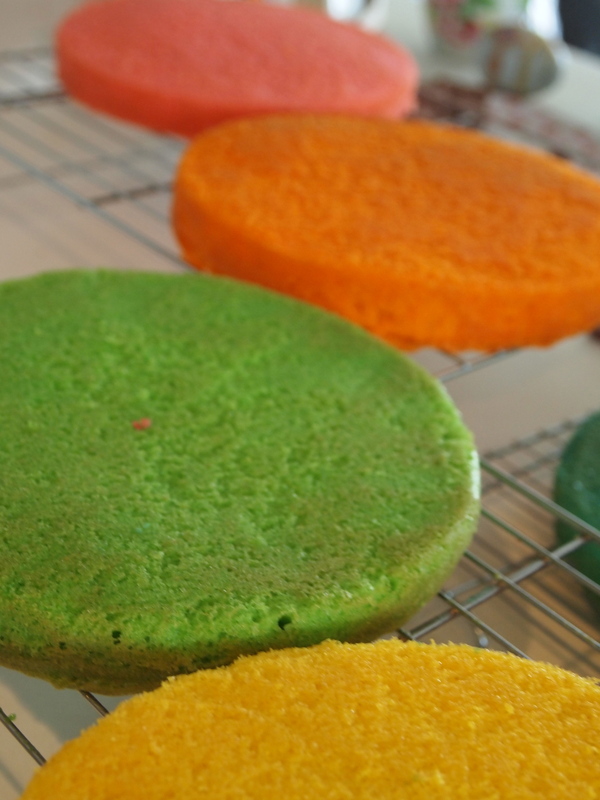 I choose Americolor for creating my rainbow colours, you need so little to create a really vibrant hue, the cake itself is a simple vanilla layer cake recipe. This cake comes out very tall so ensure you have plenty of people about when serving it up! Step 1 – Create your cake mix using a tried and trusted recipe for vanilla layer cake, once this is done share it out equally between 6 bowls. Using your americolor (or whatever colourings you prefer) add a couple of drops to each bowl and mix to desired shade. 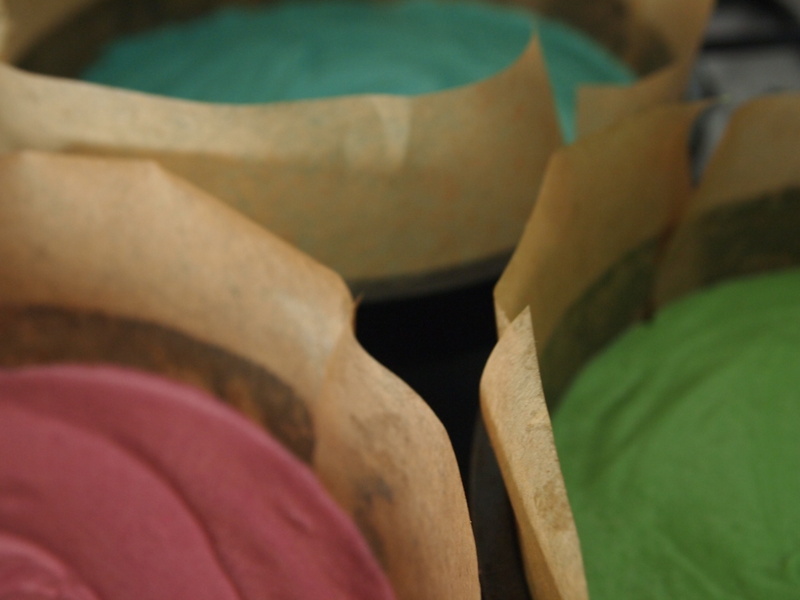 Step 2 – Pour your cake mix into fully lined 8″ cake tins and bake according to the recipe you are using. Step 3 – Once they are cooked leave to cool in the tins for about 5 mins and then turn out onto racks and leave to cool completely. Step 4 – Layer the cakes (make sure you are stacking in the right order, if it helps you can always sing to yourself – but do this while no-one watches!) 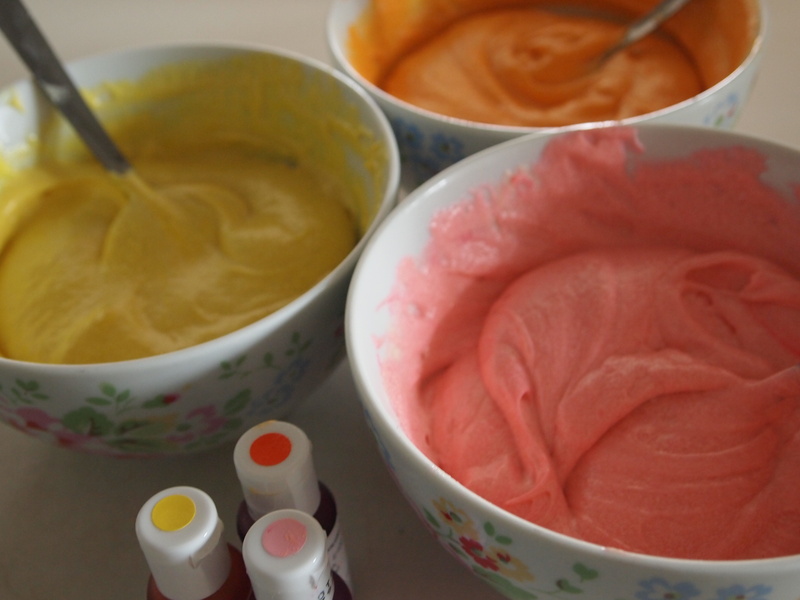 between each layer add a generous amount of vanilla buttercream – keep this a simple white/ivory colour as it will help set off the rainbow of colours in the cake already. Step 5 – add a crumb coat of buttercream to the cake layers and leave to set – then add a final thicker layer of buttercream to the cake, I like to take a palette knife and spin the cake on the turntable while the tip of the palette knife touches the buttercream creating a ridged effect. 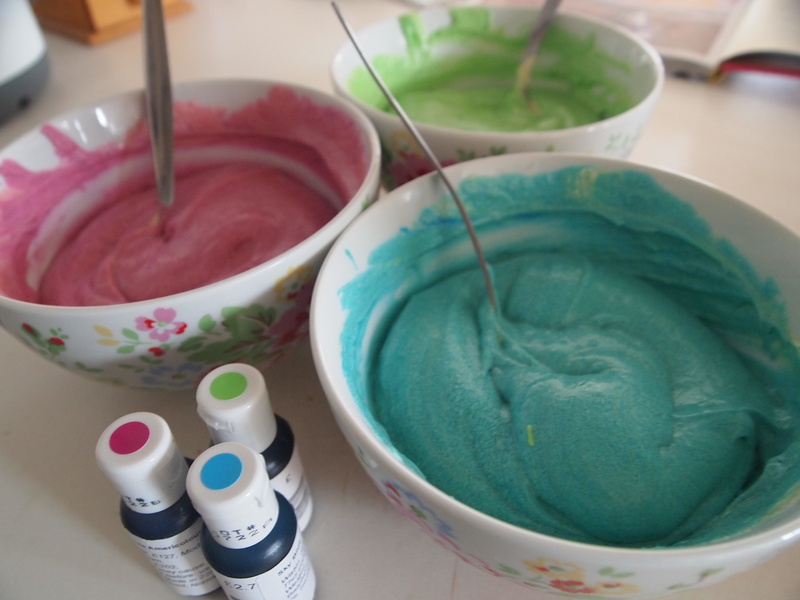 Step 6 – Now its up to you to decorate the cake how you would like! 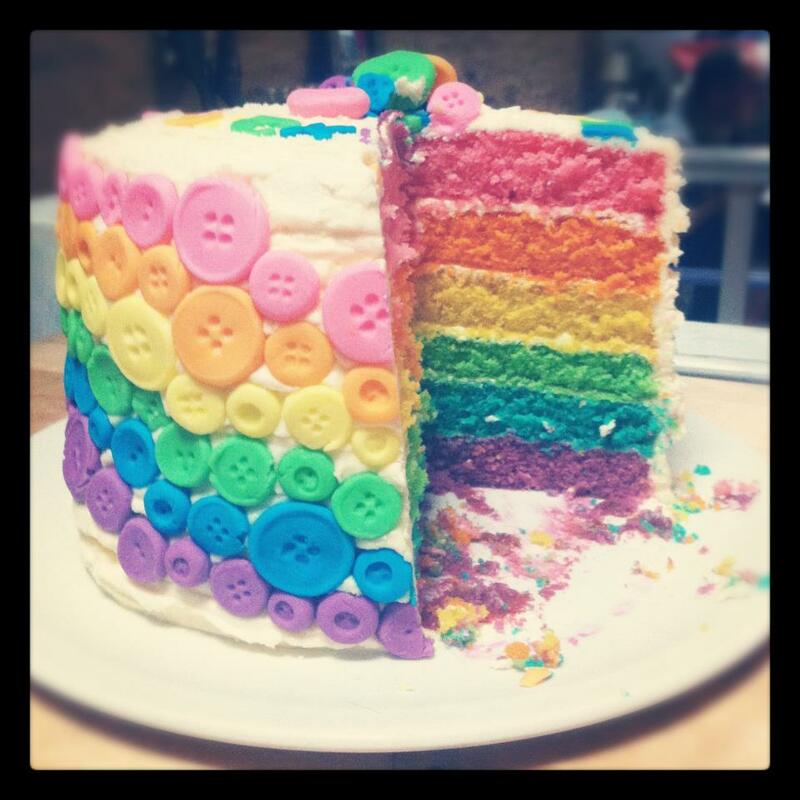 On this particular occasion the cake was for a keen seamstress so I chose to create lots and lots of sugar buttons in rainbow colours and cascade them down the cake to match the layers inside that when the cake was cut would look oh so pretty….